“Full Tang” means that the steel of the blade runs the entire length of the handle . For this style of knife the handle material, or “scales” are fastened on either side of the steel. This enables us to do the file work along the spine of the handle because the metal is exposed. We also have several EDC (every day carry) and “bushcraft” style knives available to choose from. A hidden tang (also called a rat tail tang) is a knife that has no part of the tang (the steel of the handle) visible. It's all encased and fits into the handle material. Most Japanese style knives you see are made in this fashion. 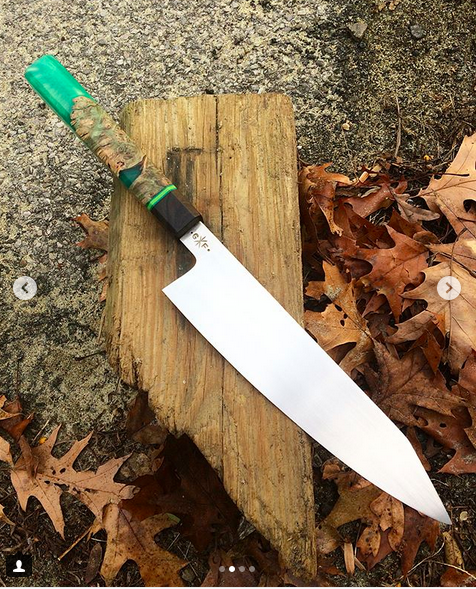 Forged and damascus steel knives are almost always hidden tang because the material and work to shape the steel, that will be largely hidden by the handle material, is expensive.